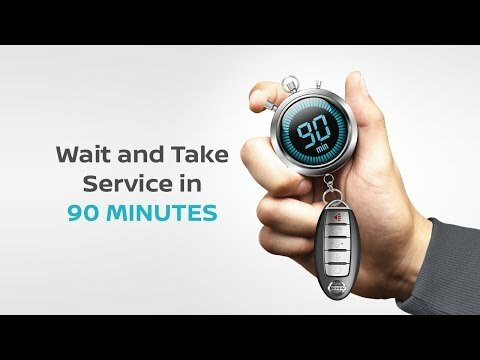 We know your time is important, that's why here a Wessex Nissan in Cardiff we are pleased to offer you a service in only 90 minutes. You can now get a dedicated time slot of your choice, dedicated parking bay and a dedicated Service Advisor. An expert Nissan trained technician will carry out your service or maintenance work, and perform a Multi-Point inspection while you wait, all turned around within 90 minutes. And you can drive in confidence knowing that your vehicle has been serviced by a trusted Nissan dealership. Nissan Express Service is now available at our dealership in Cardiff, and includes: minor service, major service, tyre replacement, MOT, minor repairs, brake inspection, brake replacement, spark plug service, wheel alignment and air conditioning service or re-gas. Call us on 029 2167 7582 . Contact us today and book your Nissan Express Service for a convenient appointment at a competitive price!